Please click here to view article on Noreena’s blog. When interviewed by Jeremy Paxman, the Prime Minister was unambiguous. 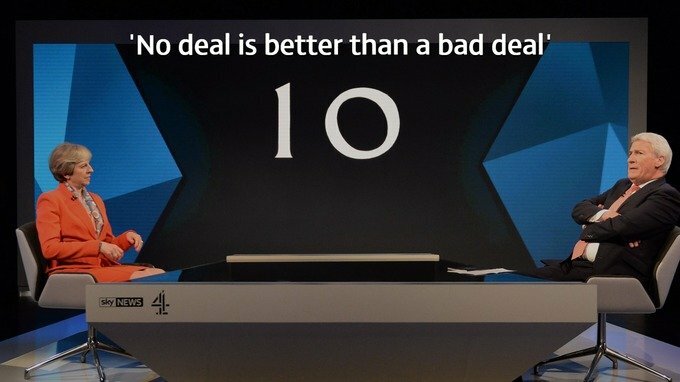 Time and time again she issued the mantra “no deal is better than a bad deal”. I get that it’s a strong negotiating posture to make explicit that you are willing to walk away if need be. But no deal means the UK would default to WTO rules. And most economists and trade experts are clear – this would come at a clear cost. – Under WTO rules countries cannot discriminate between each other. So under the no-deal scenario the EU would have to treat the UK in the same way it treats other countries with which it does not have a free trade agreement. This means it is inevitable we would have to pay higher tariffs than we currently do when we sell our goods into Europe. – For some sectors these higher tariffs are very significant. In the dairy/agri-food sector we are talking up to 40%. In the automotive and automotive parts sector, up to 10%. These sectors’ costs of production would go up which means that British exporters to Europe would have to either take a significant hit themselves or raise their prices and risk out-pricing themselves. – The Society of Motor Manufacturers & Traders warns “import tariffs could push up the list price of cars imported to the UK from the EU by an average of £1,500 if brands and their retail networks were unable to absorb these additional costs”. – Because the WTO limits the amount of agricultural subsidies a country can provide there is concern that if we default to WTO rules we won’t be able to continue paying the level of subsidies to our farmers we currently are. – Then there are of course a whole host of non-tariff barriers that would come into play were we to default to WTO rules such as having to certify that exports comply with EU rules. – IFS analysis of an under “WTO rules” scenario suggests trade between the UK and EU would fall between 17% and 29% and GDP by between 2.6% and 3.1%. That would be a loss, at 2016 prices, of between £48.6 billion and £58 billion. Through an economics lens it’s clear that no deal comes at a cost. Of course for those for whom taking back control of our borders overrides all else this may be considered a price worth paying. Low unemployment: A challenge for employers?